The first blast knocked Marco Gonzalez senseless. The next five made everything worse. “You name it, I lost it,” said Gonzalez, referring to his senses when an 81 mm mortar fired by the enemy landed about two feet from him at Combat Outpost Margah, Afghanistan, in 2012. Lucky to survive, the Army sergeant blacked out from the impact and temporarily lost his hearing and vision. “The medics there really didn’t know what was going on (with me). They just thought it was the norm … so we just trucked on.” Although he didn’t know it at the time, Gonzalez, a wheeled-vehicle mechanic, had suffered a traumatic brain injury. In the days and weeks that followed, he survived at least five more explosions, although he doesn’t remember some of them. The repetitive blasts aggravated his symptoms. “I remember having extreme, massive migraine [headaches],” he said. “They were so bad I couldn’t walk, it was hard to breathe and I couldn’t see.” Again, Gonzalez pushed on. Eventually, the pain became unbearable. He couldn’t wear his combat helmet because his head felt like it was swelling. At the motor pool, he couldn’t follow orders because his memory failed him within seconds of receiving instructions. “I started writing stuff down, but even that didn’t make sense,” he said. Gonzalez was medevaced to Bagram Airfield and diagnosed with TBI and post-traumatic stress disorder. Doctors sent him back to Fort Riley, Kansas, for treatment. Once home, he admitted that he made some mistakes. “I messed up a lot” is the way he phrased his transgressions. But he also knew he had to regain control of his life because his seven children needed him to bounce back. Stressed and breaking out in hives, the single dad got treatment for his invisible wounds. Between his full-time job as a soldier and taking care of his kids, he managed to get the medical help he needed to start his recovery. Unable to return to regular duty due to his injuries, Gonzalez waited while the military’s complex Physical Disability Evaluation System ran its course. A military wife suggested that he stop by the USO center on base to get something for lunch. After stopping in a few times with a fellow wounded warrior from his platoon, Gonzalez—who spent eight years in the Marine Corps before joining the Army in 2009—asked if there was anything he could do to help out. 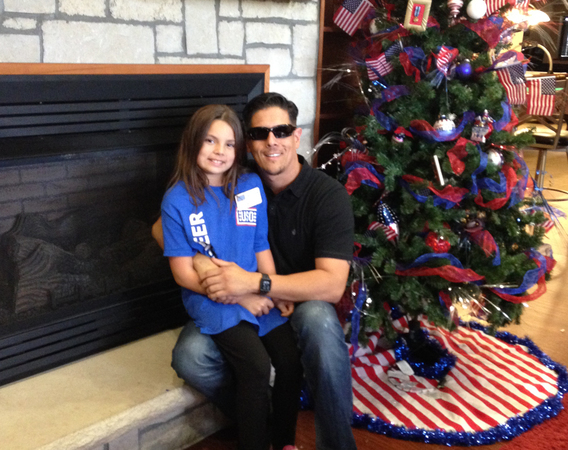 Gonzalez urges others, especially wounded soldiers, to volunteer at USO Fort Riley. “It has allowed me to talk to other people who are going through that stuff,” he said. He was medically retired from the Army in August, but that doesn’t mean that he’s done serving others. Aside from his status as a father and a USO volunteer, Gonzalez is attending Cleveland Chiropractic College in Overland Park, Kansas, so he can help ease the pain of others and improve their quality of life. His goal is to work with children and the military once he’s finished with his degree.